IPL 2017 has just started today Opera rolls out Opera Cricket to keep users in India on top of this cricket season. The new feature not only provides lightning fast cricket scores, commentary, video, and notifications when on the move but will also allow users to keep track of their favorite teams & players in one place. 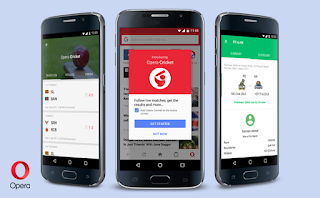 Opera Cricket services are available inside the popular Opera Mini browser for Android phones. After upgrading to the latest version of Opera Mini, users will see a "Get Started" banner to activate this feature. Then, they can start tracking scores, stats, and watching videos immediately without the need to download other apps. This window provides all the information cricket fans want to know. See all the live scores of T20 Matches, Test matches, and scorecards of the players as well. Users can stay updated with match statistics and breakdowns of the scores secured by the players.Opera Cricket delivers exciting cricket video highlights. There is no need to download or open multiple video apps to watch cricket games. Users can get all of them directly inside the Opera Mini browser and watch their favorite match highlights.